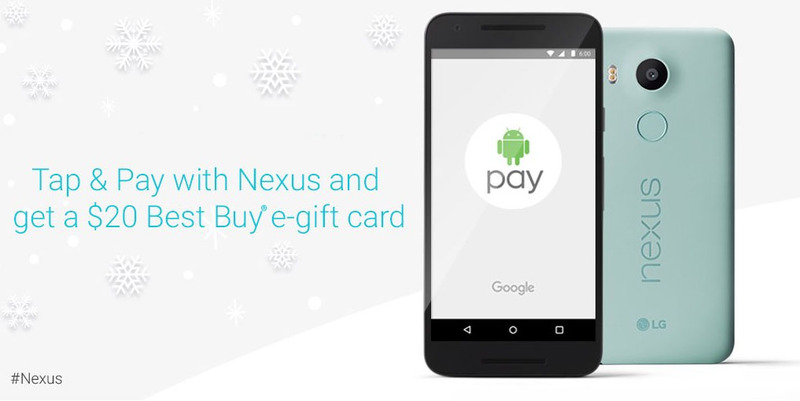 To celebrate the holiday season and Nexus devices and Android Pay and free things, Google has decided to hand out $20 Best Buy e-gift cards to anyone who uses their Nexus device and Android Pay to buy something. From today through December 31, you are eligible for the free e-gift card, as long as supplies last. In order to participate, you need to pay for something using Android Pay on your Nexus, which could be a Nexus 4, Nexus 5, Nexus 6, Nexus 7, Nexus 9, Nexus 5X, or Nexus 6P. Once you have paid for an item at a participating retailer, Google will send the e-gift card to your Android Pay app for use (make sure to keep it installed). It could take a few days (or up to January 31) for it to show, but you don’t have to do anything (don’t email Google asking for it!) else to receive it. Now, run to a Chevron and buy that pack of gum.